UNCASVILLE - Cromwell senior Lindsay Langenauer wasn't going to end her high school career wondering, "what if?" The Panthers struggled to shoot all throughout Friday's CIAC Class M final, so Lindsay Langenauer helped smooth over the rough edges. 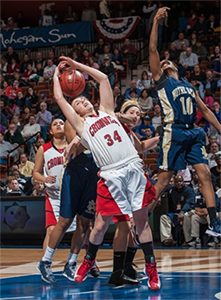 She had a game-high 18 points and three blocks along with 11 rebounds as top-seeded Cromwell beat No. 2 Notre Dame of Fairfield, 42-28, to win its first state title and finish unbeaten at Mohegan Sun Arena. It's my last game," Langenauer said. "No regrets. I didn't want to come out after the game and go to myself, I should've dove for that ball. I shouldn't have passed. I should've taken the open shots. My confidence really shined through tonight." 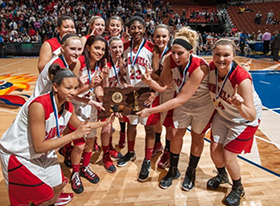 Cromwell (28-0) is the first girls' team to finish unbeaten since Holy Cross of Waterbury did so in 2007. "It's crazy," Langenauer said. "That wasn't our goal at the beginning of the season. Our goal was to get to the Sun and win the championship. Undefeated just came along with the hard work and the work we put in off-the-court." Junior Janelle Harrison had 13 points and a game-high 16 rebounds for the Panthers. Senior Kelly Flanigan added nine points, seven rebounds and three assists. Jovan Kingwood had 14 points and 12 rebounds for the Lancers (23-5). Cromwell was able to use its superior size to its advantage, namely six-foot posts Harrison and Langenauer. The Panthers outrebounded Notre Dame, 49-24. Cromwell almost had more offensive rebounds (18) than the Lancers had total rebounds. "It was huge," Langenauer said. "I think that's what really won the game, to be honest. Their guards are very good. (We had to) pound it inside, and eventually that opened up the perimeter." ND coach Eric DeMarco said, "We've been able to (overcome taller teams) at times throughout the year. They kind of cleaned the glass when we shot, and they got extra shots." Neither team could get their shots to go down. Cromwell made 12 of 42 field goals (28.6-percent). The Lancers shot 22.4-percent (11 of 49). The game was tied with over three minutes left in the third quarter when Flanigan drove and dished to an open Harrison for a layup. Langenauer made a jumper in the lane in the closing seconds to give the Panthers a 23-19 edge. They never trailed again. "I was pleased with our composure down the stretch and the way we were able to pull out the game," Cromwell coach Kelly Maher said. "You're not going to play pretty games all the time, but I thought when we needed to, we made the big plays. That's what's it's about." Technical fouls: Notre Dame-Fairfield-None. Cromwell-None.